Attending Pax East 2018 and are a fan of the Nintendo Switch console? Then you’ll want to checkout these series of articles promoting Indie developers/studios who will be bringing their titles to the show floor. Our second “Nindies at Pax East” will feature the game publisher Team17 and what they will be bringing to the show floor at Pax. Team17 is well know for many of their published franchises such as the Escapists, Overcooked, Yooka-Laylee, and more. 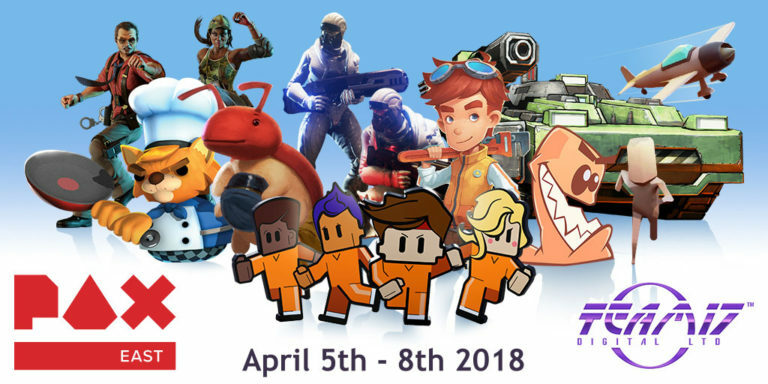 Attendees can expect to find various demos for many Switch titles such as Mugsters (first playable debut), Raging Justice (first playable debut), Yoku’s Island Express, & My Time at Portia. Like Swag? The first 50 people who play their games everyday of the event will get special pins! Can you complete the set? Team17 can be found at booth #20055 on the show floor.